The 2015 Subaru Forester boasts good fuel efficiency, advanced safety features, and numerous structural and chassis enhancements that help this 4th-generation model stand out. Where the Forester continues to one up rivals such as the Honda CR-V, Toyota RAV4 and Ford Escape is with its standard all-wheel drive. I love my Subaru Forester because. I love the size and relative fuel efficiency; I love the large back windows as well as those in front/back of vehicle. I love that it does not have too many items in the console; the simplicity is pleasing. For my height, I love opening the door and just sliding into the seat which is comfortable. Which reminds me, the legroom in front is fantastic. The heated seats are amazing, one of the best features!! However I realize other car/models have those. The back is roomy as well, behind the back seats. I appreciate the parallel bars on the hood. The sound system is nice. Perhaps the one negative is the relative noise in the car when driving, especially on the highway. Finally, I really appreciate Subaru's commitment to caring for the earth, and for the other charitable works. And the commercials are priceless!! 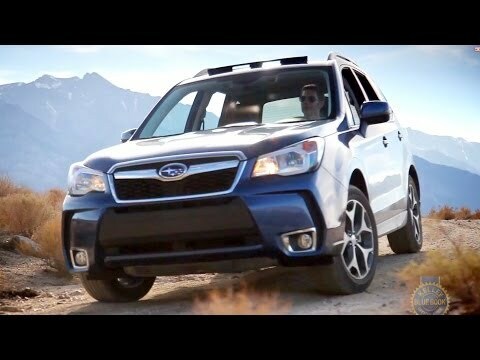 I love my Subaru Forester and have been extremely happy with its performance thus far. The only issue I have had has been regarding electrical. The sensor for the system dynamics (downhill assist, brake assist, and traction control) kept coming on and occasionally I wouldn't be able to get the car out of park and into drive. The diagnosis was a faulty sensor but the even after the fix the issue returned shortly after. Again a sensor issue, nothing was actually wrong with the car. I will say though that even with this issue I find this car to be by and far the most reliable and safe feeling car I have purchased and I am definitely happy with my choice. Reliable, yay! But be ready for the beeps. The forester is extremely reliable and easy to service. Everything you need to check your oil, fill up your windshield washer, and so on, is readily accessible and obvious. No digging around required. I have a pretty basic forester. There are only two downsides: the cloth seats stain very easily and the engine is not very powerful. Passing is a little scary because it does not respond quickly. The safety features are nice. On the downside, the vehicle beeps quite a bit. For example, it beeps if you veer out of a lane, but sometimes just a lengthy spot in the road will cause the beep to go off.